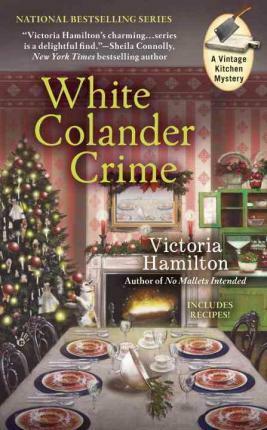 In the new Vintage Kitchen Mystery from the author of No Mallets Intended, the Heritage Society is re-creating a perfect Victorian Christmas--until good tidings go bad... Queensville has great expectations for their Dickens Days festival. A tourist-trade boon boom means a big turnout for the opening of Queensville Historic Manor and for Jaymie Leighton, food columnist and vintage cookware collector, a chance to promote the manor and give away homemade goodies. At the end of a long day of festival fun, Jaymie discovers the battered body of local woman Shelby Fretter. Shelby predicted her own murder in journal entries--and all clues point to Cody Wainwright, the troubled son of Jaymie's beleaguered newspaper editor. But considering the entire Fretter family had its share of dirty secrets, Jaymie's not convinced by the case against Cody. With twists all over, she's going to have to work like the Dickens to wrap up this investigation before Christmas--especially with the real killer ready to kill again. INCLUDES RECIPES!